Artichoke Feta Dip: Creamy, tangy, super spreadable and perfect to mix up quickly! An ideal dip for any occasion. Today’s post is kind of a new thing for me. 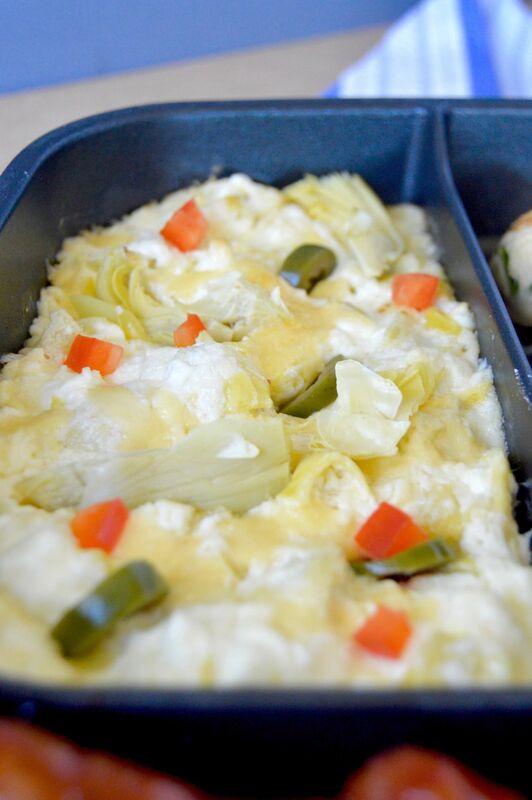 I’ll share the Artichoke Feta Dip recipe below, but its different because I was approached by a company that has a pan they wanted me to use and see what I thought. I was given the pan but all of the opinions about the pan are my own. Let me tell you all about this pan……. The pan is called a Master Pan. It arrived in a box with all these great pictures of how someone was making breakfast. Bacon, eggs, sausages, hash browns … yes, all in the same pan. You can see their website here where they show you the breakfast in the pan! The pan is divided into sections so that you can cook all different things in one pan at the same time, but the food stays separate. Think those awesome lunch trays when you were a kid. Here is a pic of what I cooked in the pan showing the different sections! To test the pan I tried it before making my normal appetizers….and I love that I was able to make 2 sections of lasagne, one with meat and onions and one vegetarian. The other sections I did the garlic bread, and some sautéed peppers to put over the top. And the best part….when I was done there was only one pan to wash. Seriously, I used a sponge to wipe away the crispy cheese remnants and threw it in the dishwasher. It came out perfectly clean! 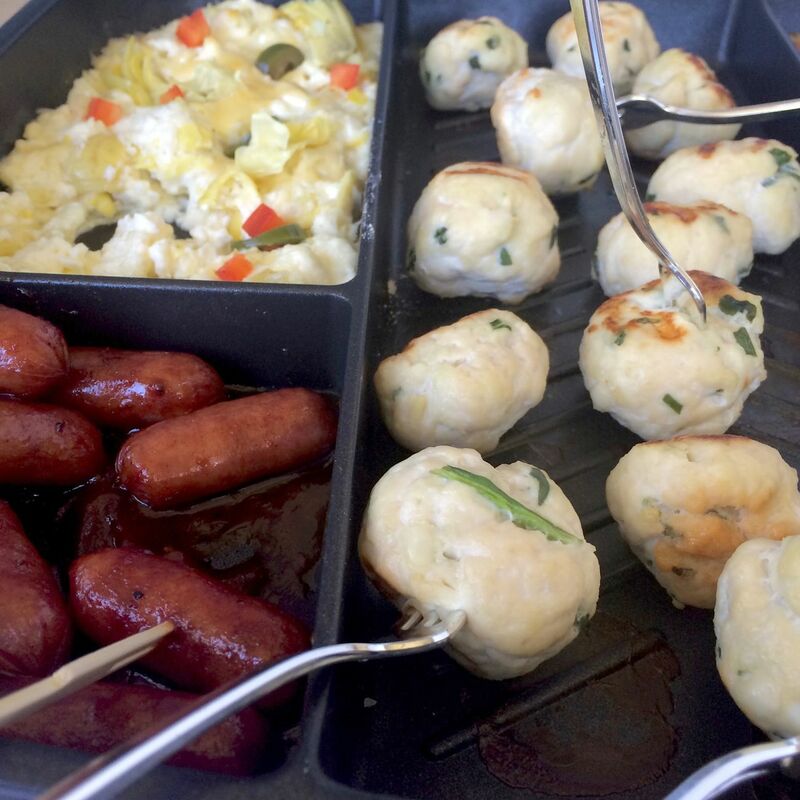 This pan was perfect to serve a bunch of different appetizers. 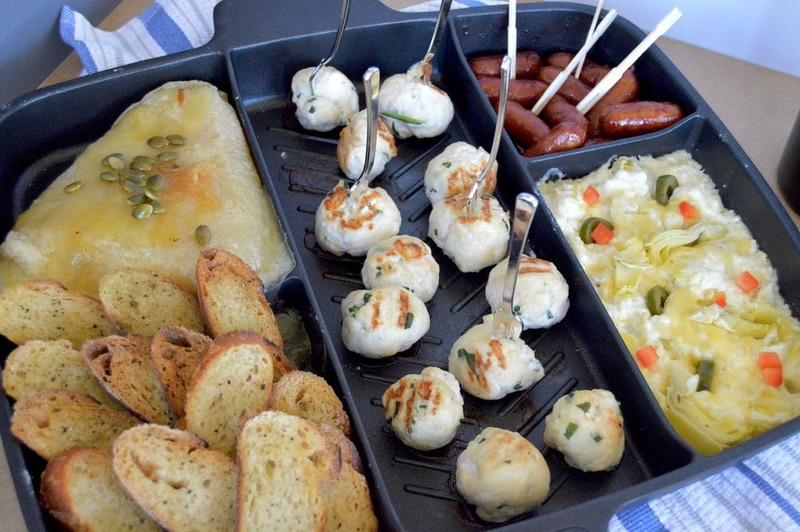 You can see here I made all of these things in the Master Pan….. the BBQ Smokies, the Turkey Meatballs, the Feta Artichoke Dip, Baked Brie and the Herb Toasts. So many people have different likes and dislikes that it is nice to be able to serve a selection of appetizers. Having them all prepared in the Master Pan allowed for super easy cleanup because they were all cooked in the one non-stick pan. The Master pan can be used on the stovetop or the oven. I actually used it both ways making these appetizers. I browned the turkey meatballs on the stove top then added the bbq smokies, Artichoke Feta Dip and the Baked Brie to the pan and baked them all for 30 minutes. You can purchase the pan direct from their website! 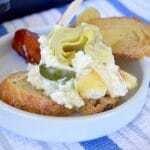 This recipe for Artichoke Feta Dip is my version of a dip I always have when I visit Minnesota. There is an Italian restaurant in St. Cloud called Ciati’s that serves this as an appetizer. It’s one of my favorites and it took my a while to get it right, but I think you will enjoy it. Who doesn’t know picky eaters or love having many different food options while also having easy cleanup? *** There are affiliate links in this post which allows me to receive compensation to defer the costs of producing this blog. But be assured all opinions expressed are my own. 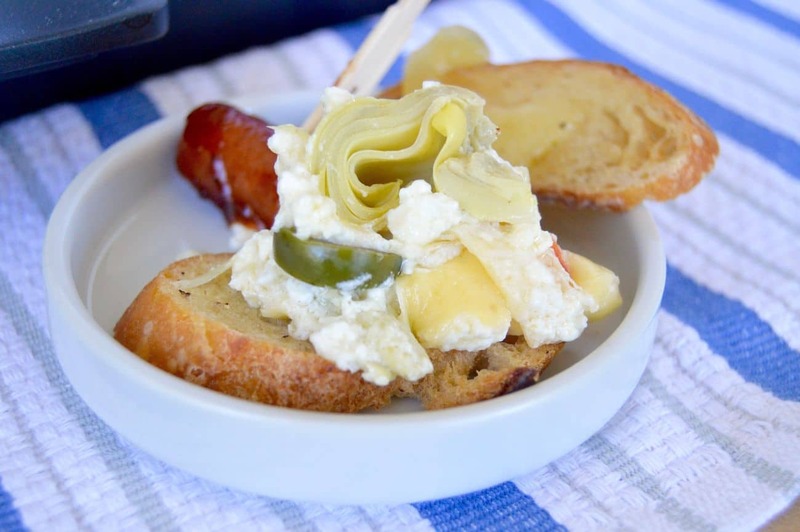 Artichoke Feta Dip: Creamy, tangy, super spreadable and perfect to mix up quickly! A perfect dip for any occasion. Mix Mayo, Cream cheese, feta, sour cream and 1/4 cup of cheddar cheese together. Slice artichoke hearts into quarters and squeeze out any excess water from them. Gently stir artichoke hearts into cheese mixture. Put into oven proof dish and bake at 325 for 20-30 mins until heated through. Sprinkle sliced olives and peppers over top before serving. Serve with crackers or bread toasts. I love everything about this appetizer! Not only is easy but it combines two of my favorite thing artichokes and feta cheese! Yum! I saw your comment to Claudia and tried this with yogurt… it really worked well! Served this for a garden party…. everyone loved it!! I totally need this pan!!! I can’t wait to get it! Love the simplicity of this. Would make a perfect party starter! Omg yes I am obsessed with artichokes!!! Never made my own dip before. Thanks for the recipe. That divided pan is a genius idea, a tasty sounding dip too and simple to make! I could really use a pan like that! Your dip sounds super good! My wife would totally go for this dip. It looks creamy delicious. The cooking tool is really cool too! Such a great pan! I love how you used it to make this delicious dip. This pan looks amazing! Perfect for serving lots of different appetizers! And your dip looks delicious! Woooow, I need this pan in my life!! And that dip – takes me straight back to Greece. Looks divine Michele !